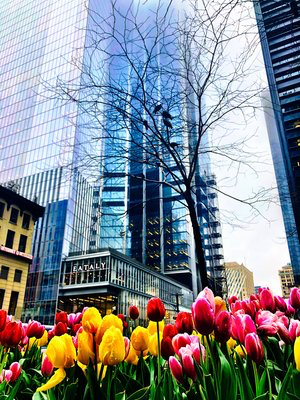 Spring is a time for renewal, rebirth, and a new start – another chance to write the script for another year. Nothing can depict the feeling and spirit of Spring more than the way I feel this morning. Yesterday, my wife, Isabel had her first comprehensive scans following her five months of chemo, and then surgery in December, only followed by another 33 radiation treatments only to find out she was then diagnosed with brain cancer which was addressed with one mega zap after all of the radiation for her breast cancer was completed. That all concluded in mid-March and yesterday she was finally ready for her whole-body scans to see the results of this challenging ordeal for her and all of us. She went in yesterday morning and we expected we would hear the results perhaps this coming week but we were happy to receive a call yesterday afternoon that all of her results came back CLEAR – NO CANCER! As you can imagine, we are thrilled and so relieved to get this news. She will go back in three months for another round of scans to continuously monitor her condition but for now she can start anew! It’s spring here at Casa Candelaria and another chance to enjoy this day to its fullest and any days God so chooses to give any of us! As the saying goes, “none of us get out of here alive”, and the day will come when we will all get the news – if we are lucky to get advanced warning – that our days are coming to an end. The play is over, the game is done, the lights are dimming to darkness. Hence, it’s always important to remember that EVERY day, EVERY hour, minute and second are precious and a time to give gratitude, create beauty, and spread love even if just in the smallest ways. And so, life continues and Isabel and I just returned from a marvelous trip to Greenwich, CT and New York City both for a little rest and rejuvenation before her tests. What a great trip and there is not a better way to start this jaunt than a trip to Thomas Henkelmann’s Homestead Inn in the heart of Greenwich, CT. With an hour plus drive from JFK Airport you transition from the hustle and bustle of the energy of NYC to the tranquil and calm of the New England countryside and the beautiful homes and estates along the way. We quickly checked in and grabbed our walking shoes and cameras and we were off on a nice two mile walk enjoying the homes along the way while the sun set over our arrival day. A fabulous romantic dinner for two at L’Escale and it was time to check in. 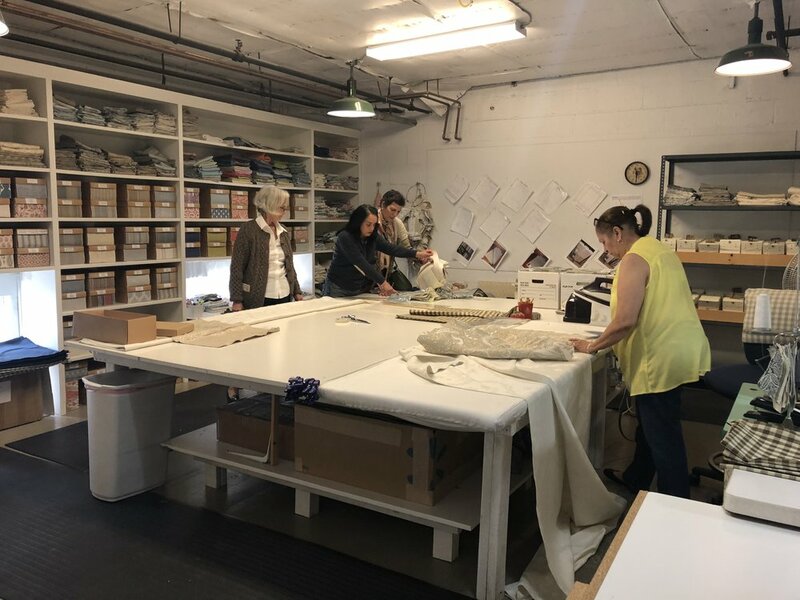 The next morning we met with our good friend, Sara Doto, who we are collaborating with on an amazing project, and she took us on a nice tour featuring first the showroom and workroom of textile and fabric artisan extraordinaire, Elizabeth Eakins http://www.elizabetheakins.com! What an amazing place and what an interesting, gracious, and just plain out fun lady. Of course Isabel and Sara were in textile heaven and I just sat and enjoyed and of course learned. Squeezing in a conference call with our team back in Arizona and our joint venture lead architects in Ibiza, Spain just to keep things moving while the ladies poured through bolts of delicious fabrics. From there it was off to another one of my favorites and another marvelous collaborator, Christopher Peacock, and his spectacular showroom Peacock Home http://peacockhome.com/homein the heart of Greenwich. 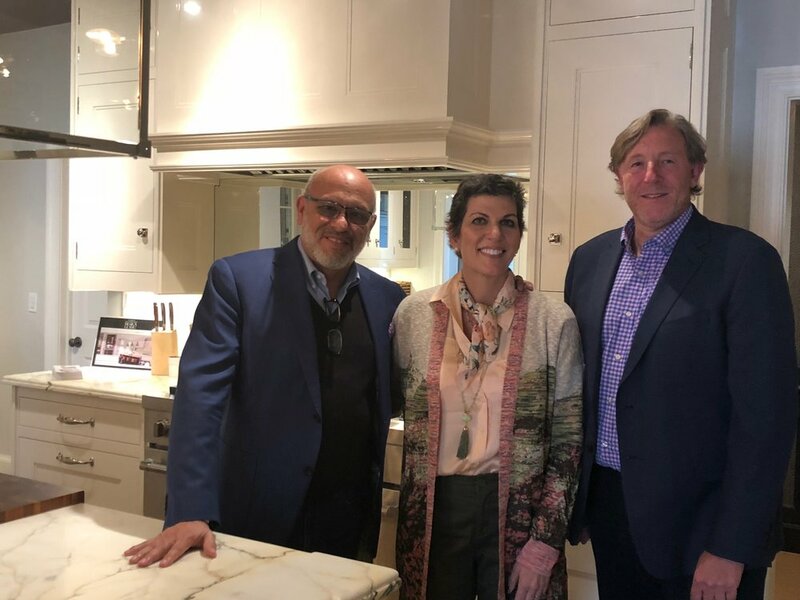 I have been blessed to work with Christopher Peacock on a wonderful Nance Construction and David Michael Miller home in Arcadia back in the early 2000’s and now again we are on stage with a spectacular home we have under construction with Schultz Development in Paradise Valley. 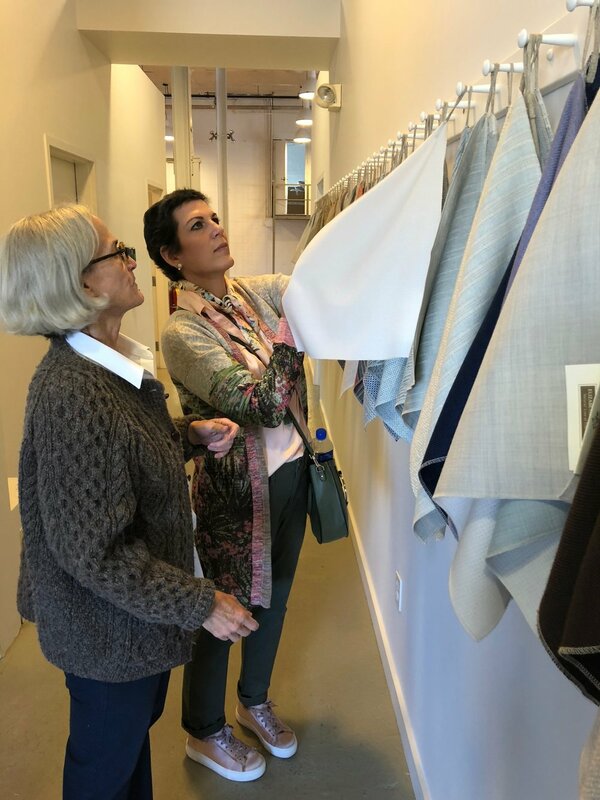 Christopher gave us a wonderful tour of his showroom along with lunch and then Isabel and I went back to the hotel for a nice siesta and catch up on emails and calls for the day. Isabel enjoying the Christopher Peacock ladies closet line. That evening we gathered the troops for cocktails and amazing dinner specially prepared by Thomas Henkelmann himself. Off the charts in terms of the service and cuisine. Definitely one of the best meals I have enjoyed and I have enjoyed some memorable meals over the years. I enjoyed the roasted duck which was spectacular. What I enjoyed most of all was the company around the table. Christopher Peacock and his wife Jayne shared their stories of how they came from London and how he established his business over the years both through the tough times and the good times. Then we met a new builder from the area, Brian Hyla, of APEX Projects http://www.apexpps.com, who builds amazing homes in the Greater NY and CT area and beyond, and of course our dear friend Sara Doto, my lovely wife, Isabel and Susan Fletchner who we are working with in connection with Paris Ceramics http://parisceramics.com. The stories were engaging and the food and wine enhanced the experience and with dinner completed we made it out to the front porch for port and cigars – a fabulous end to a most memorable day. Bryan Hyla, Christopher Peacock and MC getting ready to enjoy a little port and a nice cigar. 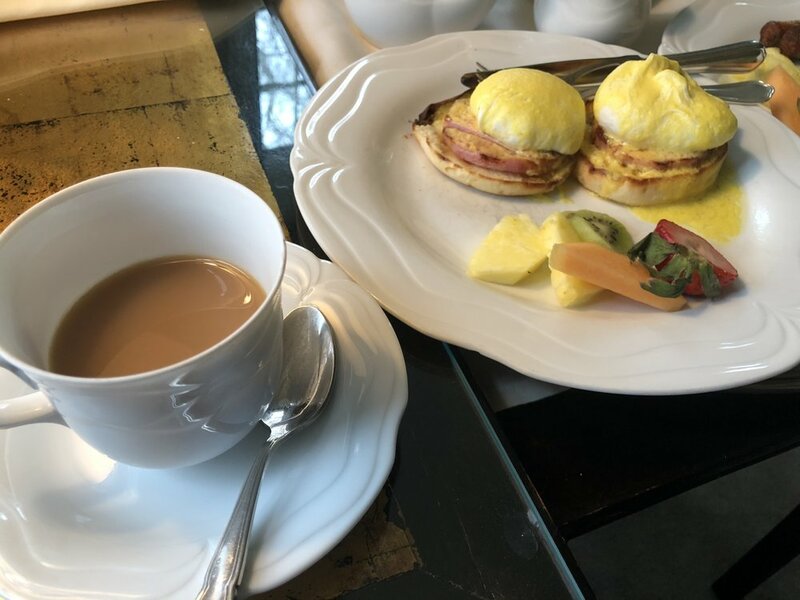 The next morning, we slept in until 7 am (eastern timeJ) and got some work done, enjoyed our tea and a light breakfast before we packed up and heading into the City! Of course, it was a rainy day and so the view of the City was somewhat obscured. Nonetheless, you can always feel the energy of the City the closer you get to its core. 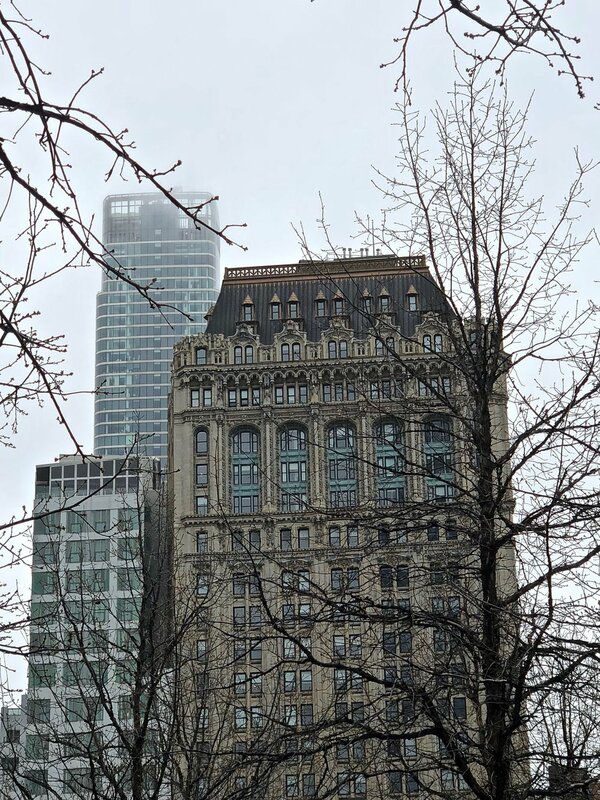 This time we stayed at the Mondrian Hotel on Park Avenue, checked in, grabbed a cab and made our way to the Freedom Tower and a quick visit of the 911 Memorial. The 911 Memorial is always so moving and the weather on this day just sort of enhanced the experience with the wafting fog drifting through and around the skyscrapers that vanished into the mist. From the somberness of the memorial we made our way to the Tower, through security which, by the way is quite intense, and then up the elevator to the 26thfloor and the offices of Architectural Digest. 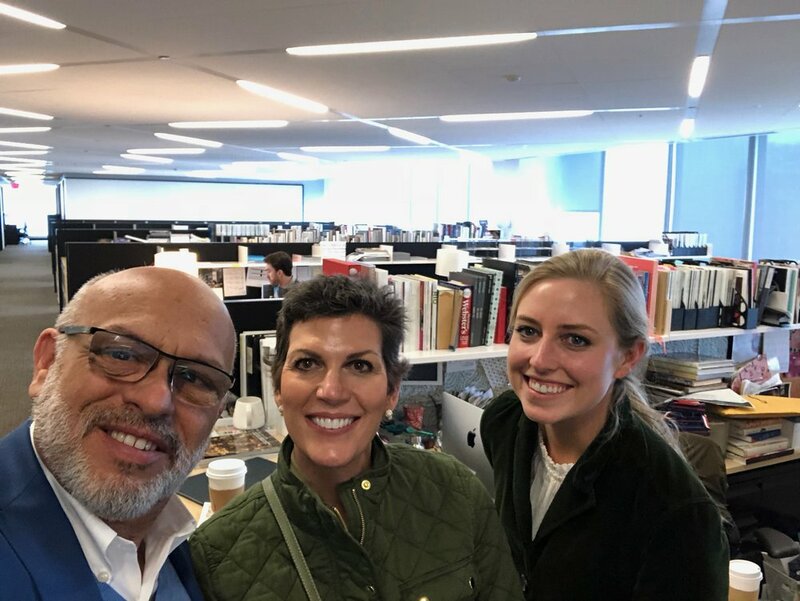 We had a fantastic meeting with Associate Market Director, Maddie O’Malley, as we discussed one of our projects that is currently under construction and will be simply magnificent. After reviewing the project progress photos and plans and the story behind the project, she kindly gave us a tour of the offices and introduced us to several of the AD team. What an experience and I am sure this is just the start of this story. 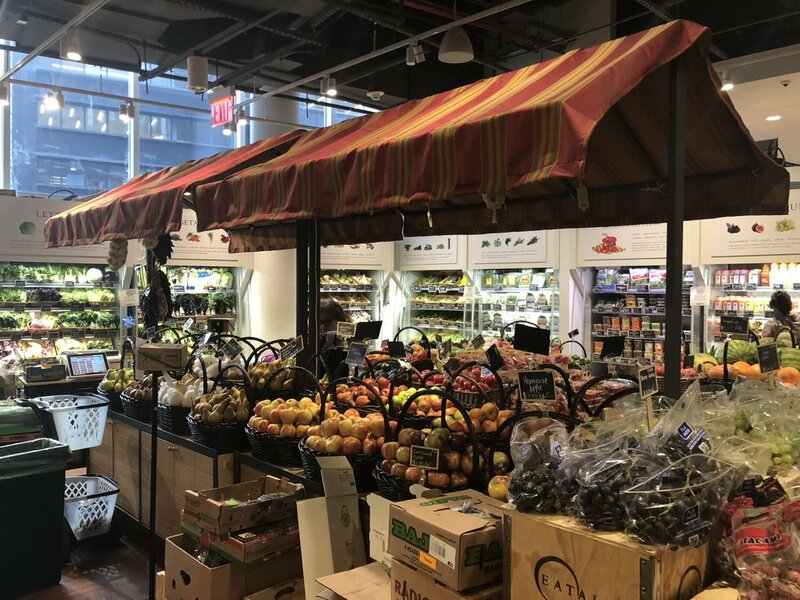 Now we just had enough time to make a quick trip to one of our favorites, Joe and Lidia Bastianich http://lidiasitaly.comand Mario Batali’s Eataly https://www.eataly.com! We love this place and one of our dreams is to bring one to Phoenix or recreate one! Isabel and I had the wonderful experience of having dinner with Lidia at Avanti’s http://avanti-phoenix.comin Phoenix a couple years ago and needless to say, we are huge fans of Lidia and Eataly. Be sure to pick up a copy of her new book which is outstanding! https://www.amazon.com/My-American-Dream-Life-Family/dp/1524731617/ref=sr_1_1?ie=UTF8&qid=1524973379&sr=8-1&keywords=lidia+bastianich+my+american+dreamNothing like a little grilled polpo for lunch with a nice sangiovese for a quick snack. 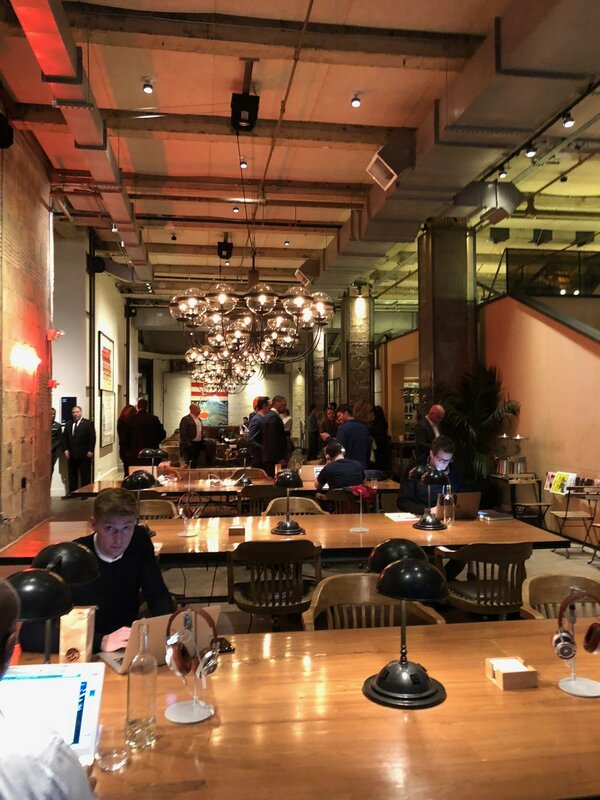 A quick trip back to the hotel and a spruce up and we were off to the shared office space of Neuehouse on 25thStreet http://neuehouse.com/location/new-york/for the LUXE Magazine RED Awards – red standing for Residential Excellence in Design. This was the purpose of our trip and of course all the other activities and experiences emerged from setting up this trip – I love how that happens all the time for us! What a wonderful event and so fun to see such a great turnout for Arizona including, Interior Designer, David Michael Miller http://davidmichaelmiller.com, Architect, Erik Peterson of PHX Architects https://phxarch.com, Michele Shelor and Alison Colwell, landscape architects of Colwell Shelor, http://colwellshelor.com, and Dana Lyon of The Refined Group http://www.therefinedgroup.comwho were all in attendance. A special call out also to Claire Ownby and John Schultz who also received an award http://www.ownbydesign.com, and http://www.schultzdevelopment.org. Isabel and I were so proud to be awarded the first LUXE Magazine RED Award for best regional renovation project for a beautiful makeover in Paradise Valley http://luxeredawards.com/2018winners/#.WuU5MC-ZOfc. It’s quite an experience to be on the same stage with the likes of Robert A. M. Stern! Our teams of Candelaria Design and Earth and Images http://www.earthandimages.comcollaborated on this project and what a makeover it was. The Candelaria Team was headed by Project Manager and Team Director, Damon Wake, and the Earth and Images team was headed by designer, Nikka Bochniak and purchaser Angelina Ponce. Together our teamwork along with builder, True Performance, took what was a home ready for new life to a whole new level. We lightened it up but kept the punches of color and we opened it up. It is truly a project we are all proud of and nothing makes me happier than the timing of this award for both of us on a project and clients we both love so much! In fact our clients have graciously offered to host a celebration dinner for all of the Arizona LUXE Red Award winners in their home in May! Project Manager, Damon Wake, Isabel and MC at our award winning project! 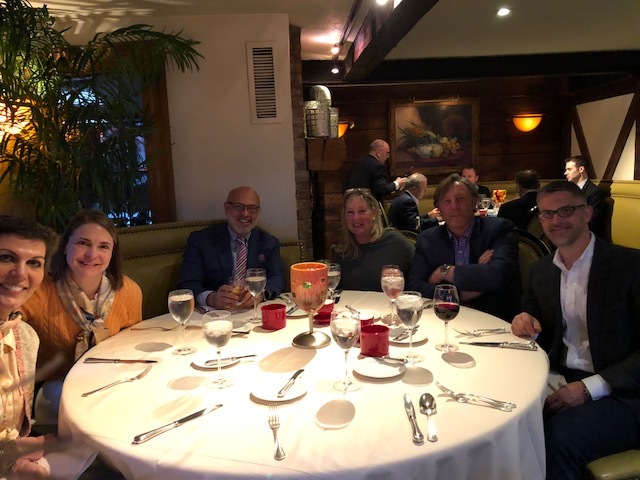 Of course, we had to go out and celebrate, and one Mario Batali venue in a day was not enough so off to another of our must stops each trip to NYC is Babbo’s in Greenwich Village http://www.babbonyc.comnot to be confused with the Babbo’s here in Phoenix…. Definitely one of our favorites and how fun to bump into co-owner Joe Bastianich as we walked in the door https://www.vanityfair.com/culture/2012/04/joe-bastianich-restaurant-man-book-excerpt-mario-batali-stoned-babbo. We always love to dine at the bar as you never know who you might be sitting next to on any given evening. Tonight’s dinner was fantastic as always, great service and spectacular cuisine. Linguine with clams for me and a savory arugula and shaved parmigiano reggiano salad with a fabulous glass of wine from Umbria. Heaven. It is amazing how this trip, just days before Isabel’s scans, added such positive light and energy mostly from the wonderful people we spent time with and the new people we met during this journey. I love how positive energy works if you just embrace it and at the same time keep sending it out to the universe. Ok and so it is back to the boards, I have plenty to get done before Isabel and I head to London in two weeks to celebrate her diagnosis and enjoy five days together. Stay tuned for that trip as it will be amazing and we are both so excited to enjoy spring in London. Send me your tips and restaurant recommendations! London here come the Candelarias!